From a historic Gilded Age mansion to an idyllic island, these places offer the chance to make a big impact on that big day. Despite the old adage that the wedding day should be all about the blissful couple — not the mother of the groom or the single second cousin who’s begging for a plus-one — well-planned nuptials can still present an opportunity to spread the love to a more noble cause. Here are seven venues throughout New England — ranging from earthy to majestic — where that big day can have a big impact. 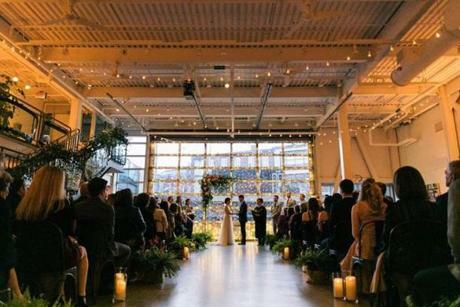 A wedding at the Artists for Humanity EpiCenter. This contemporary art gallery offers an airy, loft-style space with a glass “garage” door that opens onto a courtyard. The abundance of natural light allows up to 250 guests to see the venue’s true gems: paintings and photographs made by Artists for Humanity youth artists. All wedding revenue supports the nonprofit’s efforts to train and employ underresourced local teens in art and design. AFH’s catering partner, Gourmet Caterers, contributes a percentage of sales to its charitable work, says Artists for Humanity’s marketing director, Richard Frank. Creative couples can also work with the teens for additional design services, including invitations, screen-printed apparel, banners, and live painting during the reception. For classic couples who still want to stand out, this Historic New England property is a fairly “new” venue that can accommodate up to 200 guests. Built in 1878, the Gilded Age mansion opened to the public in May 2017, and the first wedding was held there in fall 2018. “It’s beautifully situated on a hill in Milton with incredible grounds and a beautiful, tree-lined allée,” says Patrick McNamara, the functions manager at Historic New England. “And it also has beautifully manicured lawns for lawn games.” McNamara says couples usually have their ceremony on the property, cocktail hour in the mansion and on its terraces, and dinner and dancing under a tent. All net proceeds from the rental go toward preservation of the organization’s properties. 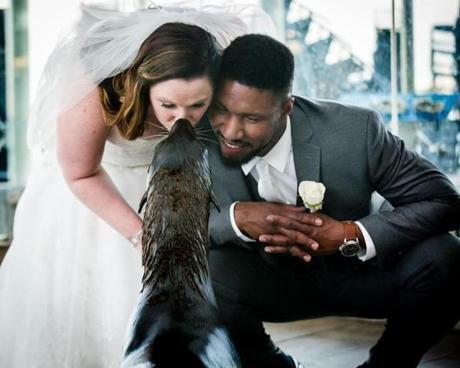 A bride and groom greet a northern fur seal at the New England Aquarium. A ceremony on the aquarium’s South Terrace in early spring or early fall may bring with it a pastel-streaked sky over Boston Harbor, according to Sara Costello, the aquarium’s event sales manager. “The sun will set, and you’ll get these beautiful purple-lavender hues that will be in the background,” she says. Of course, the aquarium’s real draw is its residents, from the penguins to the octopuses, with whom guests (up to 230 of them) can visit throughout the night. Net proceeds from weddings go toward those exhibits as well as the aquarium’s programs and research. We won’t debate the pros and cons of playing “Y.M.C.A.” by the Village People at your wedding, but imagine, for a moment, doing so during a celebration at an actual YMCA. Incredibly meta, right? Shining Tides is, in fact, a YMCA, but not your average one. The YMCA purchased the pretty shingled property in Mattapoisett from a private owner in 1963. Now it hosts a summer camp and preschool, in addition to beachfront ceremonies and porch receptions with water views for 200 people. Proceeds go toward YMCA scholarship funds, says Debbie Fringuelli, senior executive director of the Gleason Family YMCA, another branch of the YMCA Southcoast. 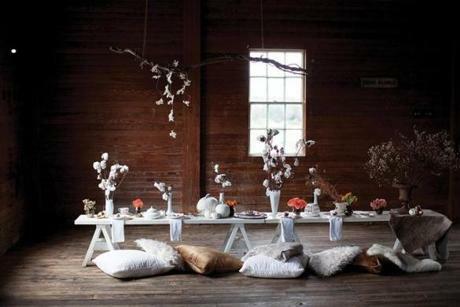 The table is set for a wedding at the Wells Reserve at Laudholm. Tell Virginia that Maine is for lovers: With ample lawns, a beach, nature trails, and a yellow barn, this saltwater farm offers seemingly every possible Southern Maine setting for romantic wedding photographs. Tented parties can accommodate 250, and that picturesque barn can hold up to 150. Plus, when couples marry here, 6 percent of the site’s wedding revenue pays for a security person, while the other 94 percent is funneled toward the Wells National Estuarine Research Reserve to support its research, stewardship, and conservation, plus maintenance of the 2,250 acres of protected land, says Tracy Kay, director of operations at Laudholm Trust. A couple embraces along the shoreline on Thompson Island. Couples who wed here can tell their guests they will be taking a private charter cruise to an idyllic island. They’ll only know they’re a mile from the city from the stunning skyline views. Thompson Island Outward Bound Education Center partners with Boston public schools to offer middle schoolers an island classroom where they can learn science firsthand. About 40 percent of the Thompson Island fee — including the venue cost, food and beverage, charter boat, taxes, and gratuity — goes toward that programming, says Laurie Sherman, executive vice president of Thompson Island Outward Bound. Get the best of the magazine’s award-winning stories and features right in your e-mail inbox every SundaySign up here.